The stepped rental packages and range of business support services means everything about Banks Mill is designed to give you the opportunity to grow. 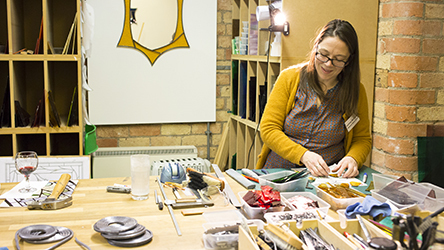 Browse through our directory of resident, member and affilate artists, makers and designers. Banks Mill is a refurbished landmark building, only a few minutes’ walk from the city centre. The University of Derby’s business support and incubation service are here to give you the best possible chance of success, helping you access all the support you need to establish and grow your business, wherever you are located. We can support you and your business through the critical stages of start-up and growth, helping you to flourish. We’ll help you right from the beginning, when your idea is just the seed of something great, guiding you through business planning, launch and expansion. Whatever stage you’re at on your business journey, we offer a range of support and guidance, with our dedicated business advisors and resident entrepreneurs on hand to help you achieve your ambitions. And you don’t have to be based here in Derby, most of our services are also available online, so you can access them from wherever you are based.